Venomous snakes strike way over their weight in regard to reputation. They can pack a punch, but the odds of encountering one in Ohio is very low. Three venomous serpent species occur here. The massasauga rattlesnake and timber rattlesnake are listed as endangered by the Ohio Department of Natural Resources. The former is an imperiled denizen of wet prairies and has declined tremendously. 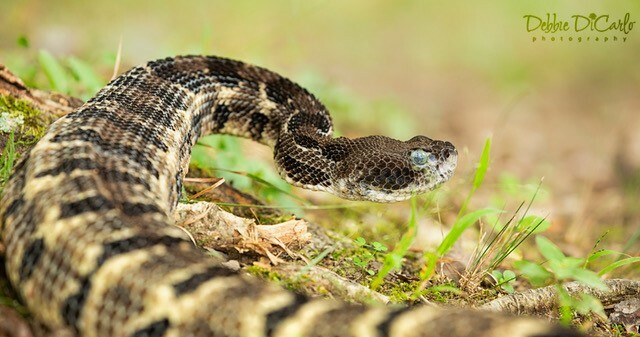 Timber rattlesnakes are rare inhabitants of remote tracts of southern Ohio forest. They formerly ranged much more widely, including the Lake Erie islands. People and venomous snakes do not coexist well. If human encroachment into their turf becomes too dense, the snakes always lose. If habitat destruction doesn’t vanquish them, persecution will. I recently got a lesson in snake/people conflict, and it wasn’t the first time. 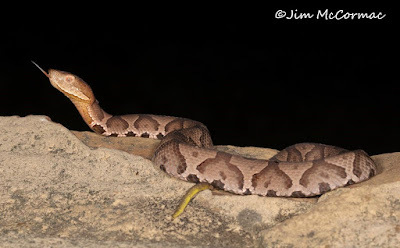 While returning from a nocturnal forest foray in southern Ohio on Sept. 15, I encountered a northern copperhead, our third venomous snake species. Years ago, I was road-cruising in the same region late on a steamy summer night. Encountering a large copperhead on the road, I stopped for photos and to move it off the pavement. Suddenly a man materialized from the gloom. It turned out I had stopped near his shack, and once he saw the snake, he began an anti-snake rant. As Shakespeare’s Falstaff said, caution is preferable to rash bravery. I said my goodbyes, and that snake probably didn’t fare as well as the protagonist of this column. My sinuous friend was docile, as copperheads usually are, and posed beautifully. It was a juvenile, with a greenish-yellow tail tip. The latter feature is retained for the snake’s first three years or so. Apparently the young snakes use the bright tail tip as a lure. By holding it out, wormlike, they attract insects and then snap them up. Adults are efficient mousers, with rodents a dietary staple. The possible reasons why people fear snakes are interesting. Some of it is undoubtedly innate. Scores of generations of our ancestors learned the hard way that bites can be dangerous. Caution is now hardwired into our DNA. Unflattering portrayals, along with adults reacting badly to snakes in front of kids, have discolored their reputation. Snakes have been here far longer than we, and they deserve space and freedom from persecution. The only way to pragmatically conserve them is to protect large swaths of habitat free from excessive human inhabitation. Caterpillars represent the vast underworld of the food chain. Out of sight and out of mind, they make the natural world go ’round. Trick question: What’s the biggest group of herbivores (by biomass) in Ohio? No, not white-tailed deer. Caterpillars. All our state’s deer would make a big heap. Pile up all of the caterpillars, and that stack would dwarf the deer. So why don’t you see many, if any, caterpillars? 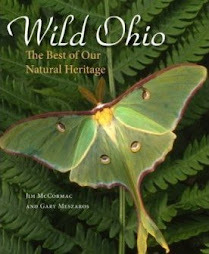 After all, these larvae of butterflies and moths are fantastically diverse, with a collective 2,000-plus species in Ohio. Short answer: They’re very good at hiding. But caterpillars are prolific and everywhere, especially in wooded areas. 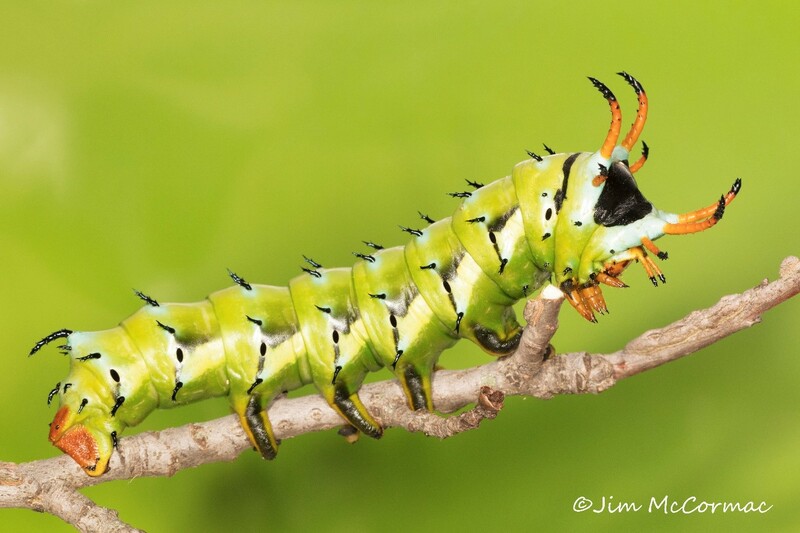 Caterpillars have evolved a large, diverse bag of tricks to avoid predators, but literally tons are still found and eaten. Experts think the mortality rate hovers at about 99 percent. Thus, most moths and butterflies engage in carpet-bombing reproduction. One female might lay hundreds or thousands of eggs. Such prolificacy is necessary to get a few through the predatory gauntlet and to the adult-reproductive stage. The fallen caterpillars did not perish in vain. Birds galore, other insects, and even mammals made meals of them. 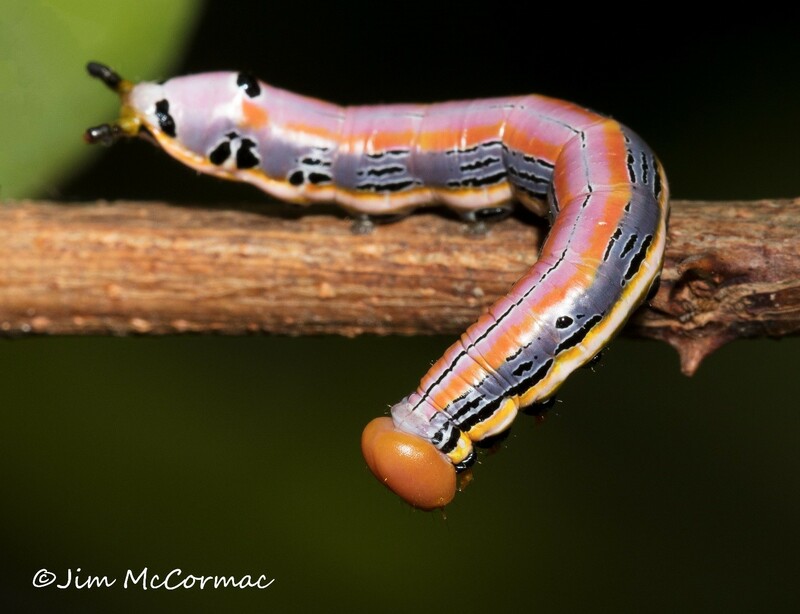 Caterpillars underpin food webs, and without them we would lose many of our higher animals. The plants that are eaten by caterpillars — which is all of our native species — would go haywire. Our group gathered to marvel at the hotdog-sized behemoth. We eventually extracted the horned devil from its tree for photos. Fierce as it looks, horned devils are harmless. The orange-and-black spines do no damage, nor does it bite. However, the shock-and-awe factor probably sends most songbirds fleeing. Come spring or summer, the adult moth, which is known as a royal walnut moth, will push from the ground. The adult moth is bat-sized, orange-brown and as spectacular as its larva. Unlike its gluttonous caterpillar phase, the moth does not feed, lives but a week or so, and exists only to find a mate and reproduce. Hickory horned devils are an important part of the ecology of hickory, sweetgum, walnut and a handful of other trees. Most other caterpillars are tightly wedded to a small suite of plants that are indigenous to their area; they will eat nothing else. Caterpillar production is a huge part of why conservation of native plants is vital — they serve to fuel much of the rest of the food chain. Nearly all caterpillar species shun non-native flora. By planting native species in your yard, you can help generate little sausages for birds and other critters. A gorgeous pastel sunrise colors the foggy waters of Turkey Lake in Shawnee State Park, Scioto County, Ohio. 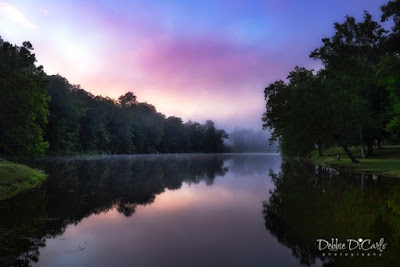 Debbie DiCarlo and I conducted our 6th Focus on Photography workshop on the weekend of September 1 & 2, based at the beautiful lodge within this park, which is imbedded within the 65,000 acre Shawnee State Forest, with easy access to various photographic hotspots in nearby Adams County. For more on our workshops, and next year's schedule, GO HERE. We had a great group of eight people: Dan, Molly, Suzee, Dan (another one! ), Charlie, Patty, Michele, and Eric. Lots of interesting subjects presented themselves, and we got lots of practice in shooting a wide range of plants, animals, sunrise, sunset, and even conducted nocturnal work. Day Glo orange fungi, the fan-shaped jelly fungus, Dacryopinax spathularia, adorns an old red cedar log. Just one of myriad wee things we found. 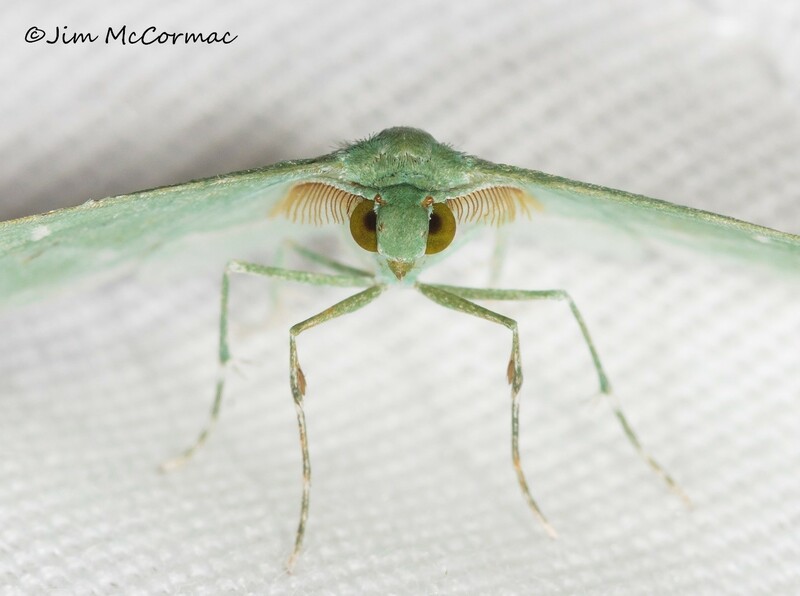 Macro photography was a major part of this photographic foray. A big timber rattlesnake, Crotalus horridus, poses for Debbie's camera. We were fortunate to catch the dynamic park naturalist, Jenny Richards, at her center and she had this and several other snakes on hand. They are educational animals, and have been used to enthrall thousands of visitors over the years. More importantly, Jenny uses them to teach about the importance of snakes in the environment, and hopefully win them new fans. 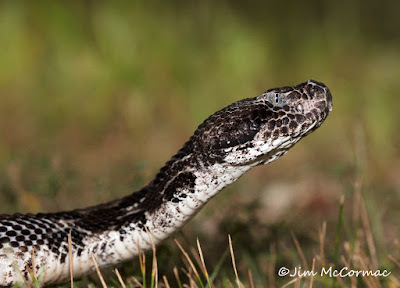 A portraiture shot of the other, darker, timber rattlesnake. Everyone got ample opportunity to admire the beasts and learn how to make a snake look good in pixels. Shawnee and vicinity teems with flora - perhaps 1,000 native species! - and we saw many of them. 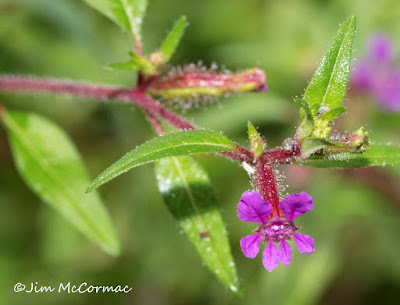 This one is blue waxweed, Cuphea viscosissima. It's an elfin plant, but beautiful upon close inspection. The stems, leaves, and flower calyxes are beset with sticky hairs, probably to dissuade insects from reaching the flowers from the ground. Winged pollinators only, please! 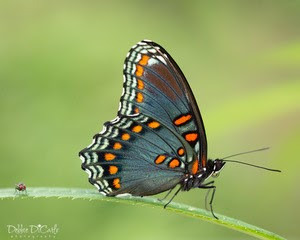 A gorgeous red-spotted purple, Limenitis arthemis, poses nicely. This was just after a rain shower, which worked to our advantage. This butterfly and others were holed up and drying off, allowing for lengthy photo sessions. Saturday evening, while the rest of us were stalking caterpillars and other nocturnal quarry, Debbie pulled out her astrophotography lens and gave a lesson on shooting stars. She made this gorgeous image of the Milky Way right before our eyes. 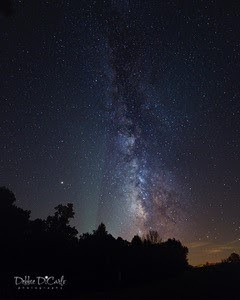 There are not many places where stars can be seen with this clarity in Ohio. Both her and I love to shoot astrophotography and whenever night skies cooperate on one of our workshops, we're more than willing to take everyone out to try their hand at it. Before and after Debbie's star-shooting lesson, this is what we were stalking - caterpillars. Most caterpillars are nocturnal, emerging under cover of darkness to avoid diurnal bird and insect predators. This one is a black-spotted prominent, Dasylophia anguina, one of the showiest of our myriad species. 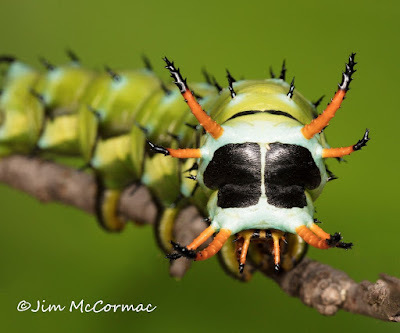 Caterpillars make for absolutely wonderful photo subjects, and not too many people shoot them, especially the harder to find species such as this. We found scores of species, and everyone went home with lots of interesting caterpillar material. Looking surreal indeed is this tiny badwing moth, Dyspteris abortivaria. Another perk of nocturnal activities was "mothing". Molly and Dan Kenney, keen mothers/caterpillar'ers as well as photographers, brought mothing lights and other gear and we set up a mothing operation that yielded many interesting subjects. In all, it was a fantastic weekend with dozens of subjects covering enormous diversity. I think everyone upped their game photographically, as well as their knowledge of natural history. 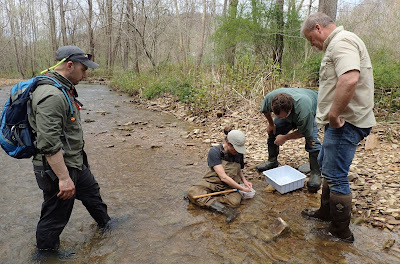 One of our goals with these workshops is to impart a deeper understanding of the natural world. Not only does this help one better find interesting subjects, but also better see how they fit into the bigger picture. In a way, we're teaching "conservation photography", as we want to help people obtain images of Nature that they too can use to pique interest in the natural world. On that last note, we were thrilled when a gentleman (who wishes to remain anonymous) funded a scholarship for a young person to attend this workshop. Thus, we could offer a full ride to Dan Hodges, who is three years into his career as a naturalist with a western Ohio park district. He is full of intellectual curiosity, already has a commanding grasp of natural sciences (more commanding now! ), and is quickly upping his photographic game. We are very grateful for the donation that made this possible, as it totally supports exactly what we are trying to accomplish. If you like nature in all its facets, and photography, I'm sure you would enjoy one of our workshops and we would love to have you attend one. CLICK HERE for details. Bird program: This Thursday night, 7 pm! 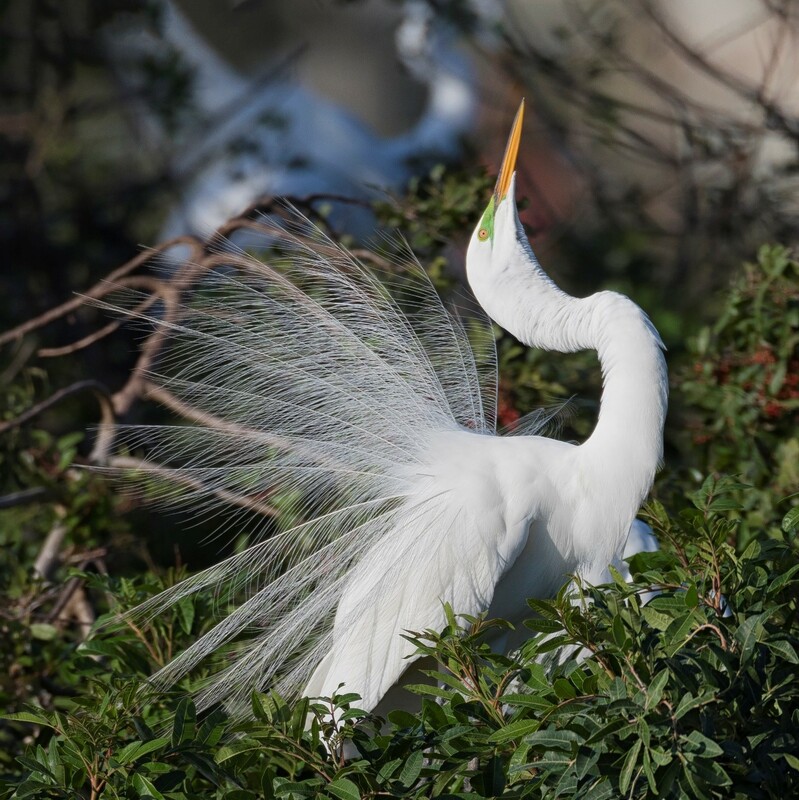 A great egret displays its aigrette feathers - the showy plumage that nearly led to its demise. I'm giving a free program this Thursday evening, commencing at 7 pm, at the Grange Insurance Audubon Center in Columbus, at 505 West Whittier Street. All are welcome. The talk is entitled Bird Conservation: Ups and Downs, and will be an Ohio-centric look at some of the winners and losers, why species have plummeted or increased, and some of the ongoing challenging conservation issues. Lushly illustrated with imagery, of course. 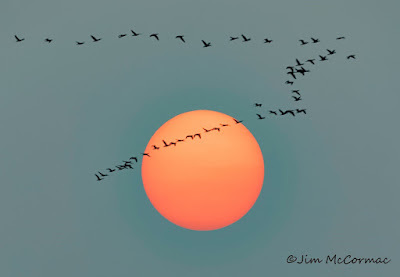 Speaking of images, I have a gallery of 30 bird images opening in the Audubon Center that very evening. Please feel free to come early if you'd like to peruse them. The gallery features photos taken throughout eastern North America, and each one is accompanied by a brief description about the bird. Doors open at 5:30 pm. A worm-eating warbler scans a wooded slope in southern Ohio's Shawnee State Forest. 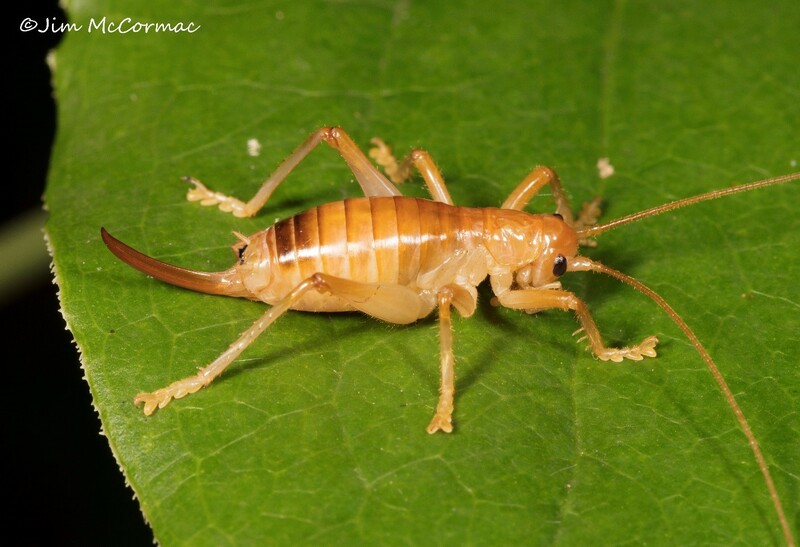 A female Carolina leafroller cricket, Camptonotus carolinensis, emerged from its lair and exploring leaves at night. I made this image last year in a southern Ohio forest. While these exceptionally long-antennae'd crickets are not rare, they are furtive and secretive. During the day, they hole up within rolled up leaves, hence the name. Come nightfall, they roam about on lower-lying foliage, and are quick to hop away with tremendous leaps if disturbed. Here we have another female Carolina leafroller, but things have not gone swimmingly for the beast. Indeed, one of the worst possible fates imaginable has befallen the cute little cricket. Laura Hughes, I believe, spotted the zombified orthopteran on a field trip to an Adams County, Ohio hotspot last Saturday. Never one to miss a chance to photo-document an attack of the zombie fungus, I took the opportunity to shoot some images of this fine example of a fate worse than death. 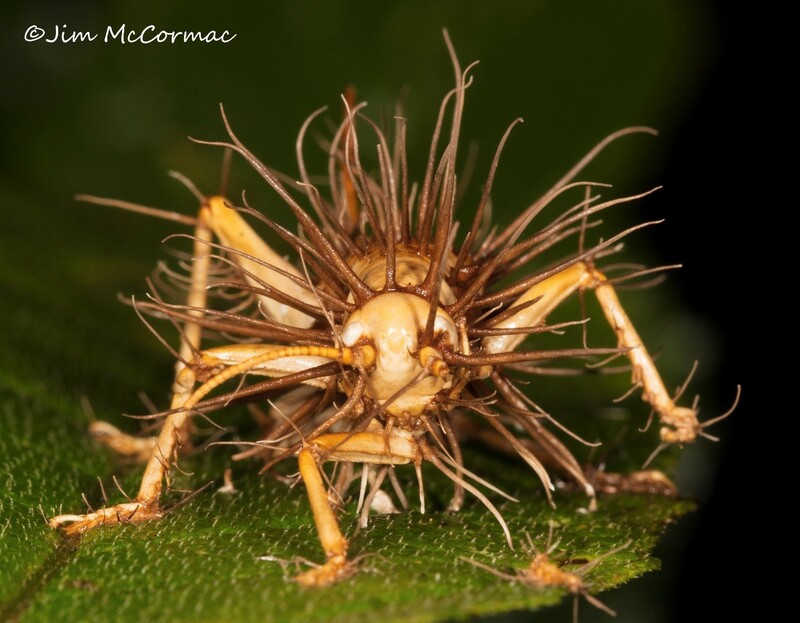 We look into the dead white eyes of the cricket, which bristles with emergent fungal hyphae. 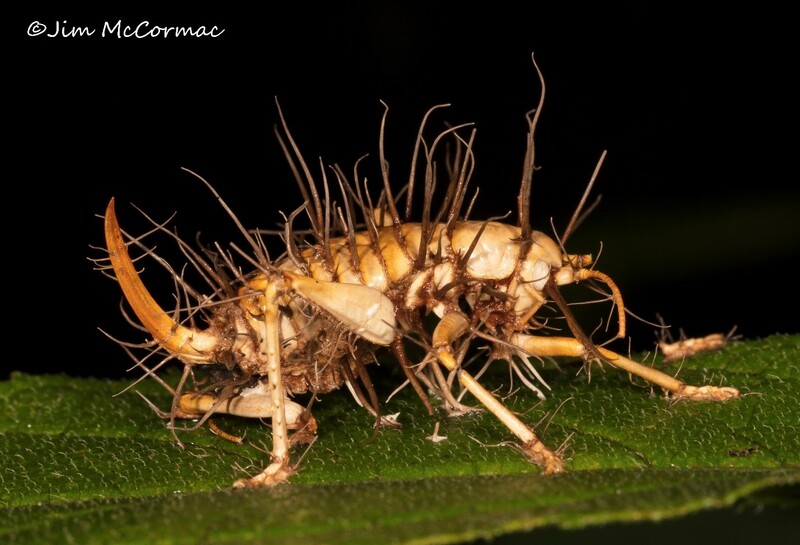 Cordyceps fungus, at least certain strains/species, attacks various small arthropods, eventually causing the demise of the host organism. I have seen it infecting other orthopterans, spiders, caterpillars, and other critters. Apparently fungal spores land on and gain a beachhead on a suitable host, and then the fun begins. Fungal strands worm their way into the victim's core, and rapidly grow throughout the body, consuming the soft parts. Cleverly keeping the host alive as long as possible - if a fungus can be considered clever - the fungal siege grows in intensity. In a last hurrah, the fungus somehow rewires the cricket's brain to force it to act in an entirely unnatural way that is to the fungus's benefit. Chemical commands from the fungus direct the cricket to climb to a prominent exposed perch, and once it's into a space exposed to breezes, the cricket - or whatever victim it may be - tightly seizes the substrate. In a horrifying grand finale, the fungal hyphae kills the cricket and caps its homicidal performance by shooting conspicuously elongate strands of hyphae from the host's body. 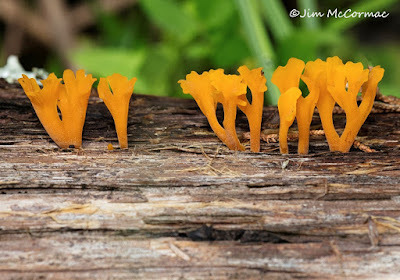 Spores are released from pores at the summits of these hyphae and waft off on the wind. Some of these will find their way to other hosts and begin the zombification process anew. I suppose we humans should be glad this sort of fungal attack has not yet made its way to Homo sapiens. Early in my birding years back in the 1970s, a double-crested cormorant was a big deal. Most years saw fewer than a dozen reports, and any birder would brake hard for cormorants. DDT, a pesticide once sprayed with impunity, had caused a precipitous decline in their population. The fish-eating cormorants are an indisputable winner among our avifauna. Following the 1972 ban on DDT, cormorants adversely impacted by the pesticide began a slow ascent out of the abyss. Today, they are again abundant. 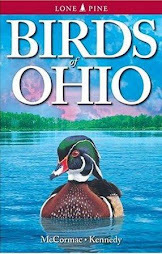 In 2016, a book titled “The Second Atlas of Breeding Birds in Ohio” was released. It summarized mountains of data generated during a statewide survey conducted from 2006 to 2011. Two of the most interesting tables are found on pages 48 and 49. They show species with the largest increases, and decreases, from the first atlas, which took place from 1982 to ’87. It’s no surprise that two of the biggest winners were also DDT recoveries. The bald eagle spiked a whopping 2,300 percent, and the peregrine falcon increased 1,200 percent. As with the cormorant, DDT disrupted their reproductive cycles by causing fatal thinning of eggshells. Other reasons causing upticks in bird populations are interesting and varied. Wild turkeys have boomed because of the state wildlife agency’s ambitious stocking program, plus habitat recovery. A steadily warming climate might be permitting black vultures and blue grosbeaks — both southerners — to expand northward. Opportunistic cliff swallows have learned that large bridges are good substitutes for rock faces and now create colonies on many large spans. Sedge wrens have been the beneficiary of prairie restorations and grasslands established through the Conservation Reserve Program. Harder to explain are northern breeders spreading south, such as the winter wren and yellow-bellied sapsucker. Recovery of formerly denuded forests might explain their increase; they are recolonizing former haunts. Less encouraging is Table 4.3-2, which lists the species with the most significant declines between breeding-bird atlases. It is a much larger list than the expansion table. The fascinating “butcherbird” or loggerhead shrike leads the list with an 82 percent population drop. The carnivorous songbird is a victim of habitat loss: the shift from wildlife-friendly agricultural landscapes to highly manicured corn- and bean-scapes devoid of habitat. Declines of many other species correlate with large-scale changes in agricultural land-use; they include the bobolink, northern bobwhite and upland sandpiper. Less clear are losses of eastern whippoorwill and ruffed grouse. These forest dwellers might be victims of changing woodland ecology wrought by an increase in invasive plant species and loss of biodiversity. 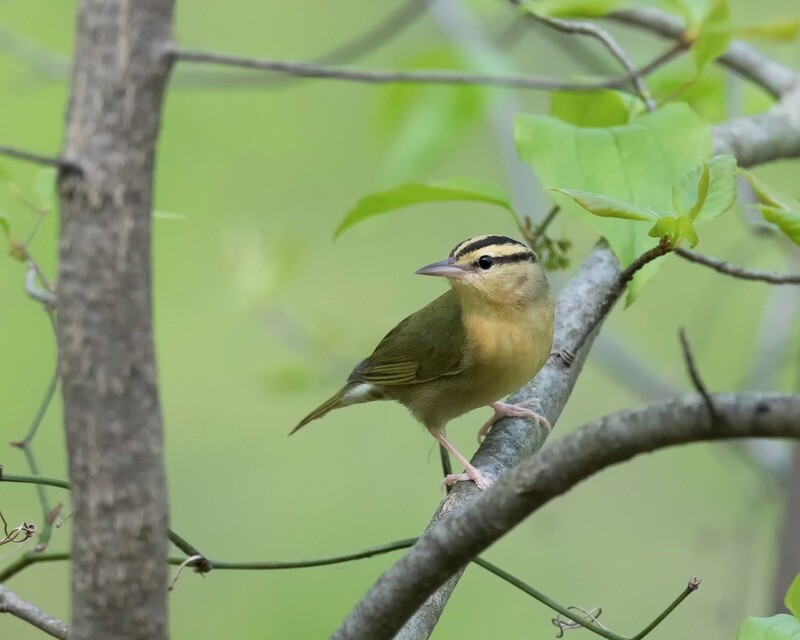 Declines in other forest birds, especially the cerulean warbler and veery, might be in part caused by their nomadic lifestyles. These birds and many others nest in Ohio forests, but they migrate several thousand miles to winter in tropical forests of Central and South America. They face threats on the wintering grounds, and numerous man-made obstacles along the migratory corridor. ‒ Jim McCormac will give a presentation about Ohio’s role in bird conservation at 7 p.m. Sept. 13 at the Grange Insurance Audubon Center, 505 W. Whittier St. The discussion will explore the winners and losers, reasons for changes, and what can be done to help. Admission is free. 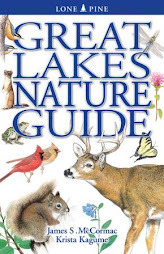 For more information, visit http://grange.audubon.org/.